Last week was a week of lasts. They made this special picture with him and his teacher! He loves his teacher "Sassy" (her name is Sally but that's what he calls her). He had her wrapped around his little finger. We joked a lot about him - he's just a very active boy!!! He is always climbing on things or getting into things. I have to laugh because I have had several people who have kept him at church and then they will say to me "Oh you weren't kidding! You must be so tired!". He's sort of a legend at his preschool. 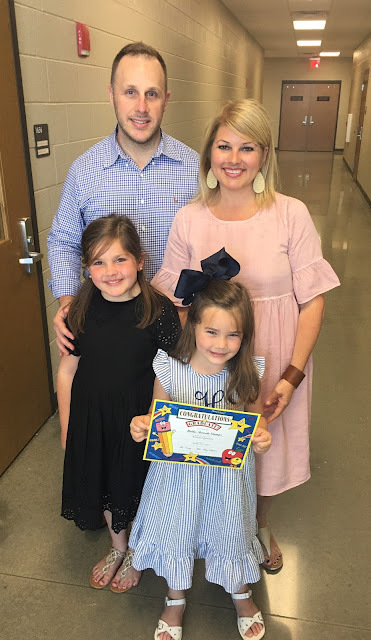 Hollis had her kindergarten graduation. It was at the new high school in our town so it was fun to get to go and look around at it. My sweet girl. She LOVED kindergarten! I was so glad she loved it so much and came out of her shell! Hollis was so lucky to have all of her grandparents there too. It worked out for them all to come and we were so glad! I know it made Hollis feel so special! We celebrated with snow cones later that afternoon! Friday was our last day of school. Both girls had such good years! I love to see how they have changed both physically and mentally and emotionally. I can't believe I have a first grader and a third grader in my house. They were just toddlers!!! We are ready for a summer of fun!! !